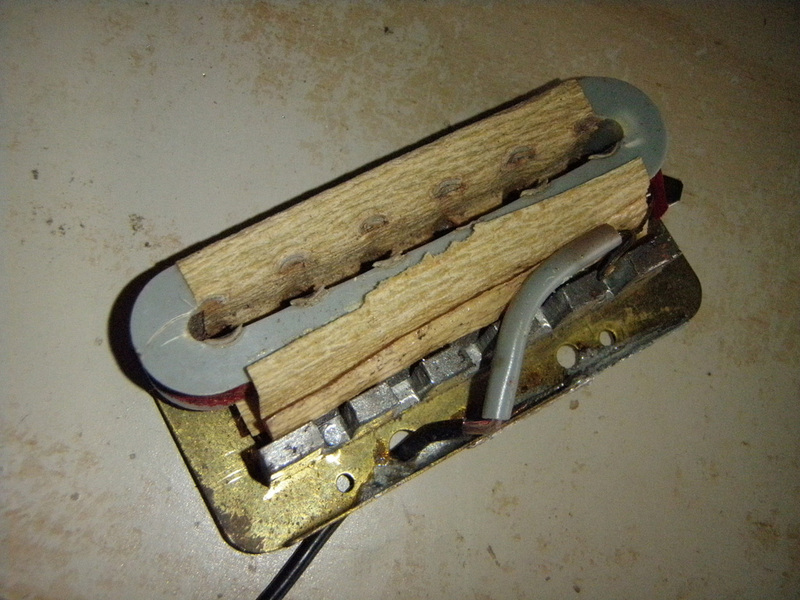 … was the volume pot for that particular pickup, I was hopeful that after cleaning it out with contact cleaner, the sound would come back. However, after plugging the whole thing in, it became apparent that there was another problem. The (working) neck pickup measures a very healthy 4.9kohms. Which is my multi-meter’s way of saying infinity ohms (or in other words a completely dead pickup). Well, I did say a long time ago that part of the reason I was doing this restoration was to learn new things. I guess this latest problem might as well go in there too, so today's (unplanned) blog post will be about how to repair/rewire/rewind a guitar pickup. After quite a bit of research, it seems that two copper wire thicknesses were used over the years to wind these particular Hofner "Diamond Logo" pickups, namely AWG 43 and AWG 44. AWG 43 is slightly thicker than AWG44, making it more difficult to fit enough on the (very small) bobbin to achieve the required resistance. Nevertheless, I decided to go with AWG43 because it is less likely to break during the winding process (even AWG43 is considered pretty thin for pickup winding). 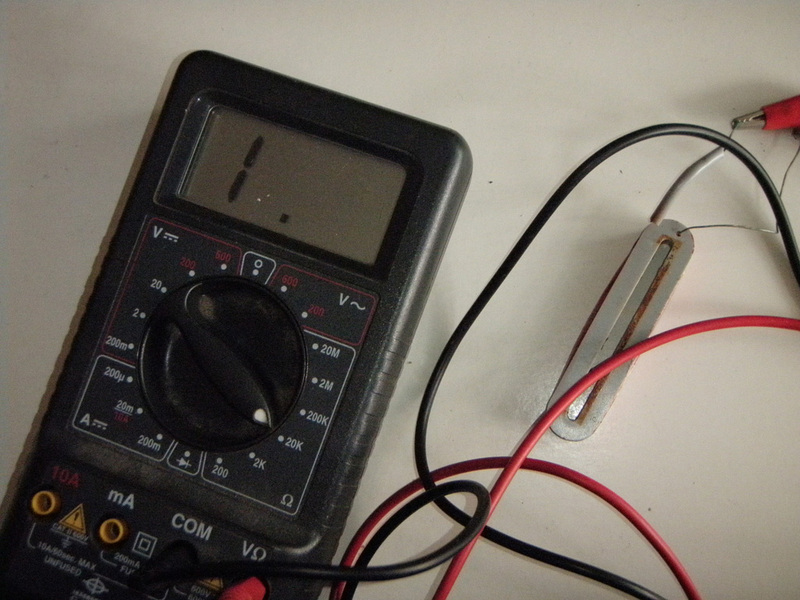 What you see in the photo above is a pedometer, some wires, a reed switch and a couple of magnets. In total, it cost around NT$89, two quid, three bucks, or whatever it works out as in the currency you are acquainted with. Shown below is the inside of the pedometer. It's a very basic mechanism, which I'll try to explain as simply as possible. The metal bit at the top is a rocker arm that bounces up and down with every step you take, making contact with the piece of metal just below it each time. You can also see a really thin piece or wire (which also acts as a return spring), which maintains electrical contact between the rocker arm and the other piece of metal at the bottom of the pedometer circuit. The rocker arm and the spring can be removed very easily and the two new wires can be attached directly to the two metal contacts instead. The other ends of the wires are connected to the reed switch, which will close the circuit each time a magnet passes close to it. A drill is held down extremely tightly to a workmate bench with velcro straps. The pedometer/counter is clipped onto one of the straps and the reed switch is taped onto the end of an old toothbrush handle and located as close as possible (without touching) to the magnets, which are taped onto the drill chuck, with a bit of rubber padding behind them to stop them from magnetizing the whole chuck and confusing the reed switch. A bolt passes through the bobbin and is held on tight with a nut and washer before being clamped into the chuck. I've also clamped a piece of metal with a hole drilled in it to the workmate. The diameter of the hole is the same as the internal width of the bobbin and acts as a kind of lateral movement limiter (does that make sense?) Basically it's to stop the thread going too far in either direction, causing it to fall off the side of the bobbin. Finally I leave the new spool of thread on the ground and pass it over my finger before then passing it through the hole and onto the pickup bobbin. I can control the tension by gently pressing down a little with my thumb. I have to say, though, this thread is extremely fragile, so most of the time I was more concerned about it sticking to my finger without any help from my thumb at all. It did actually break after about 170 turns and I had to start again, but luckily that was the only time. Note that at 200rpm, getting to 5000 turns took 25 minutes.